Violet, 12, Seraphina, 9, and Samuel, 6, joined their actress mom as she received a star on the Hollywood Walk of Fame on Monday. When the time came to accept her star on the Hollywood Walk of Fame, Jennifer Garner brought her whole entourage. While the actress was celebrated with speeches by Steve Carell, Bryan Cranston and Judy Greer during the unveiling of her star in front of the Miniso store on Hollywood Boulevard, her most important co-stars during Monday morning's event were her three children. Her daughters Violet, 12, and Seraphina, 9, and her son, Samuel, 6, received a shoutout as their mother accepted her honor. 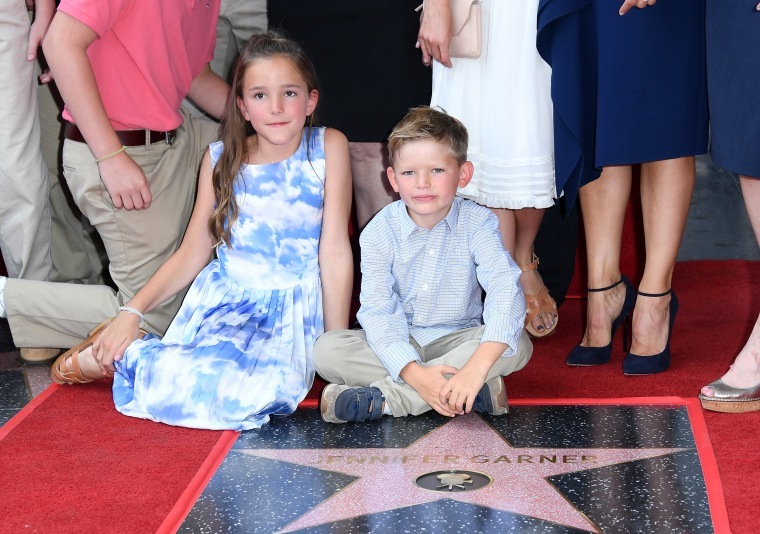 "For my children, when you walk over this star, I want you to remember first of all that I love you and that this is about hard work and good luck and not a whole lot else," Garner told her kids from the podium. "You define me, not this wonderful spot on the pavement," the 46-year-old "Peppermint" star added, before quipping, "Also, for the record, don’t spend too much time on Hollywood Boulevard." The ceremony marked a rare time when her children were photographed in public. The kids' father, Ben Affleck, did not make an appearance at the event. Other relatives, including Garner's parents, however, did make the pilgrimage to the Walk of Fame. "A special shoutout to my niece and nephew, who are missing their first days of schools to be here today," Garner said. "In the Garner family, fame matters more than education." Garner added that she felt honored to be moving into "a lovely, nice neighborhood," with her star located near those of Tom Cruise and Zoe Saldana, among other big names. Jennifer Garner cooks with the Barefoot Contessa!